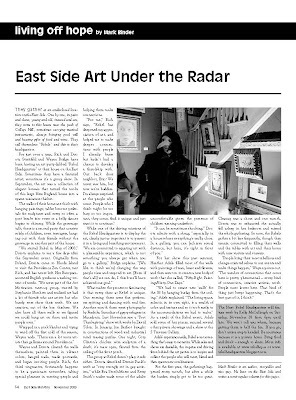 Rebel HQ in the East Side Monthly magazine in October. By Mark Binder. on the East Side. One by one, in pairs and clans, young and old, insured and un, they come to this house near the peak of College Hill, sometimes carrying musical instruments, always bringing good will and bearing gifts of food and wine. They call themselves “Rebels” and this is their headquarters. Streitfeld and Wayne Bridge have been hosting an art party dubbed “Rebel Headquarters” at their house on the East Side. Sometimes they have a featured artist; sometimes it’s a group show. In September, the art was a collection of elegant bonsais that turned the nooks of this large New England house into a sparse miniature thicket. out with their friends without the grownups in another part of the house. Wayne and Dorota cleared the walls themselves, painted them in vibrant colors, banged nails, made postcards, and began inviting people. Rich, the third ringmaster, fortunately happens to be a passionate networker, taking special pleasure in meeting people and helping them make connections. spitting and dancing with real fire. Another month there were photographs by Fredrika Sumelius of gypsy refugees in Macedonia. Last November saw a “Post Thanksgiving” show with works by David Tobin. In January, Jim Barfoot brought in constructions of wood and industrial mind teasing puzzles. One night, Cory Clinton’s chicken wire sculpture of a shark, it’s maw open, floated from the ceiling of the front porch. while Eva Stosik-Moers and Kerry Smith’s nudes made some of the adults uncomfortable given the presence of children running underfoot. Adels explained. “The living space, eclectic in its own right, is a wealth of color and texture and so it took easily to the accommodations we had to make.” As a result of the Rebel event, Adels sold some of her pieces, secured several other private showings and a show at the 5 Traverse Gallery. that’s easy to monetize. While sales and shows are desirable, the impetus and driving force behind the art parties is to inspire and collect the people who will meet, blend and then spawn new combinations. every month, but after a while the burden simply got to be too great. Cleanup was a chore and one month, Dorota was so exhausted she actually fell asleep in her bedroom and missed the whole gathering. So now, the Rebels gather a bit less frequently, though they remain committed to filling their walls and the tables with art and their home with new visitors and viewers. Mark Binder is an author, storyteller and nice guy. He lives on the East Side and writes a semi-regular column for this paper. This entry was posted in Uncategorized on October 27, 2009 by dorota. sounds magnifique! i finally understand what all these facebook invitations are about.